The actual Trail starts in the ancient town Mollepata at an altitude of 2.800 m. An alternative trail starts from Mollepata to Santa Teresa. It is a 5 hours drive from Cusco along the road to Abancay to get here. We got sooner in this little town to start the first day of the track early enough. Today is a long walk through the Cordillera Vilcabamba. Streets are not paved. Some shops are found in this little town to buy fresh bread or things you might have forgotten. Our guide Carlos was waiting for us at the Plaza de Armas. He arranged 7 horses and a donkey to bring our stuff over the steep mountains. In the first part of the trail, horses are allowed untill the town of Wayllabamba. If you are doing the 4-days trail, chasquis must be rented to carry luggage. This can best be arranged in Cusco. Around the Plaza de Armas in Cusco there are lot's of agencies offering services to do the Inca Trail. We choose to rent additional horses to pass the first two days horsriding. This option is relative cheep. We paid only $3.00 a person a day. It is warmly advised to take this possiblity because the first days are really hard. The trail goes from 2.800 m to 5.300 m at the mountain pass of Salcantay. 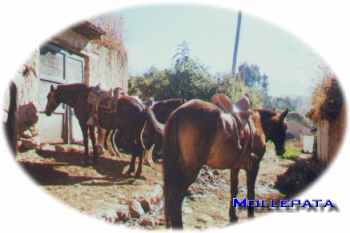 The family of Carlos offered us a light brunch, beans with rice, while he and the two cowbows were preparing the horses. The picture on the left is taken right at their house. We left at 11 in the morning. I didn't forgot to take a last beer before the road. In the end, this is the last place of some civilization in one week. Cheers! The trail only rose and rose. We were lucky to see the beautiful scenery from top of a horse. The trail, all the way only one meter wide, consisted mainly of sand and rocks. It is admirable how limber horses are in mountains. Carefully they make every step giving a save feeling to the rider. Facing a deep abyss all the time next to the road, this was frankly quiet necessary. But don't blow your nose like a lighthouse... scaring a horse called imprudente or careless! The long walk had a rest at 2 o'clock for lunch. Flattered by a beautiful view, we were enjoying rice with vegetables. Our cook Zenon was a vegetarian so no meat would be served the next 8 days. For the first time we could see the tremendous mountain Salcantay. After lunch, we continued our way because the way was still long. The view of this beautiful mountain wasn't going to leave us the next 3 days. Buenas tardes es Espa�a: Deseo ponerme en contacto con Carlos, el guia de la ruta al Salcantay. Muchas gracias, espero su comunicaci�n. 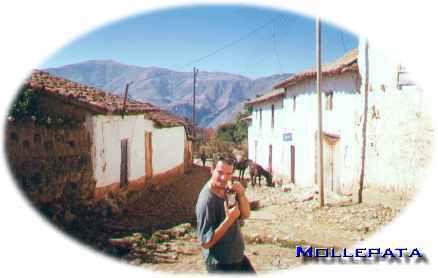 This tour seems cuite fantastic and we are about to visit the Machu Picchu december-08. Now we wonder how you arranged this tour and who we should contact? Did you contact a guide when you got to Mollepata or did you do that from home? If you could send us an e-mail or annything that could help us we would be extreamly gratefull!! best wiches on your next tripp!